The Chorale had the opportunity to work with Morten Lauridsen in preparation for this concert, thanks to the generosity of the Oregon Repertory Singers who brought him to Portland for their April concert. As he worked with the Chorale, Lauridsen shared stories of growing up in the Portland area, singing in the church choir at Bethel Congregational (where the Chorale will perform his work in June), and living in his secluded cabin in the San Juan Islands where he wrote the Lux Aeterna on his beloved $50 piano. His stories and his expressiveness at the keyboard demonstrated the deep emotion that went into creating this piece, written at the time of his mother’s death. Lauridsen finished the rehearsal by telling the Chorale, “This is one of the best communitygroups I've dealt with ever, and it’s right here in my home town.” Both pieces on the concert are accompanied by organ, played by renowned organist Dan Miller. Miller teaches organ at George Fox University and is a “Rodgers artist” for Rodgers Instruments, one of the world’s leading organ builders. Miller has been a featured artist at some of the most iconic organ venues in the world, including the Mormon Tabernacle and the Crystal Cathedral. Performances of Sacred Masterworks: Lauridsen + Duruflé are on Saturday, June 10, at 7:00 p.m., and Sunday, June 11 at 2:00 pm at Bethel Congregational United Church of Christ (5150 SW Watson Ave, Beaverton). The Oregon Chorale is a 70-voice symphonic choir based in Hillsboro, Oregon. 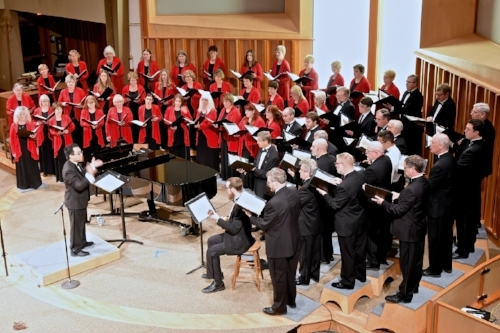 The Oregon Chorale has been delighting audiences since 1985, performing choral music from around the world and maintaining an appreciation for technique while exhibiting flexibility of musical style. Its formal concerts showcase a variety of styles from classical to baroque, renaissance to contemporary. Its less-formal presentations include world folk music, spirituals, dinner theater and original musicals. For more information on the performances or to set up an interview with the artistic director, please email oregonchoralepr@gmail.com or go to www.oregonchorale.org. Ticket Pricing: $15 for adults, and $10 for students and seniors, free for kids 18 and under.